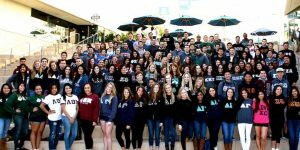 San Diego Limo Rental supports all our local colleges and Greek Fraternity Sorority houses. We were part of San Diego Fraternity in our college days so we know what's expected and how to maximize fun! With San Diego Greek Frat Sorority Limousine Bus Rental Services, choose your group vehicle from SDSU, CSUSM, or USD to take you to a Downtown Nightclub, dive bars in North Park, or wherever your planning the nightly shenanigans. 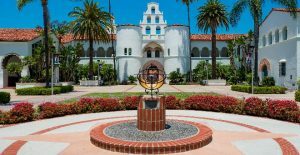 We provide Limo and Party Bus Transportation Services to all the local San Diego Colleges and Universities. We not only provide Limo, Limo Bus, and Party Bus options but Sedans, SUV's, and Sprinter Vans for the smaller groups at an affordable price. We guarantee you will have an amazing time with any vehicle we set you up with at The Lowest Limo Discount Rates in San Diego. We know that Uber or Lyft are very viable transportation options throughout San Diego County, but they don't offer that extra pazzaz and you can only fit 6 passengers. Choose any San Diego Greek Frat Sorority Limo Rentals, for that next Fraternity Formal or Sorority Formal up to 20 passengers. SUV limousines are widely popular and make a statement when you arrive. The most popular options for Fraternities and Sororities are San Diego Party Buses. San Diego Greek Frat Sorority Bus Rentals come in all models, colors, and passenger capacity up to 56 passengers. Looking for a Party Bus from Cal State San Marcos to downtown? We have been running Buses from CSUSM and SDSU for over 15 years so we know how to do it right at a price everyone can afford. We also work in the San Diego Nightlife to offer discount San Diego Nightclub packages. Just ask any of our amazing sales representatives for further information. We have perfected the way we price out Limo Transportation Services in San Diego. San Diego Greek Frat Sorority Limousine Bus Rental Services Pricing can easily be determined using our internal software with prices that have been intricately negotiated with multiple Limo Companies throughout San Diego. All Limousines, Sedans, and Buses are available with Point to Point Rates, One Way Transfers, Hourly Service Rates, and Hybrid Pricing.